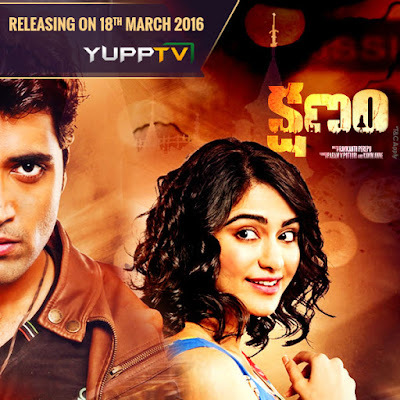 YuppTV Blog: Latest Telugu thriller ‘Kshanam’ makes its digital debut, exclusively on YuppTV! New Delhi,March 17,2016: Underlining its commitment to provide high-quality and timely entertainment solutions to its expat users, YuppTV, the world’s largest Over-The-Top (OTT) provider for South Asian content, will be the exclusive partner for the digital premiere of Telugu thriller film ‘Kshanam’. Starring Adivi Sesh, Adah Sharma and Anasuya Bharadwaj, the film marks the debut of director Ravikanth Perepu. It will be available on YuppTV from March 18, for its users outside India. From the dusty by lanes of Golconda to Hyderabad’s financial district, from the beaches of Vizag to the streets of San Francisco, Kshanam’s story follows the protagonist as he traverses all these places to uncover a mystery bigger than he could have ever imagined. Produced by renowned production house, PVP Cinema, with a story by Adivi Sesh, ‘Kshanam’ has stormed the box office in Andhra Pradesh, Telangana, Karnataka, Kerala, Tamil Nadu, North India and the US with rave reviews and superb collections. YuppTV has 25000 hours of entertainment content catalogued in its library, while nearly 2500 hours of new on-demand content is added to the YuppTV platform every day. YuppTV offers Live TV and Catch-Up TV technology. YuppTV has its presence in more than 50 countries. It has recently launched YuppFlix, a movie on demand streaming service for Expat Market and YuppTV Bazaar an online marketplace for the premium content curator. YuppTV is currently ranked #1 Internet Pay TV platform for South Asians living abroad and also the largest Internet TV platform from premium content availability in South Asia. YuppTV is the most downloaded Indian SmartTV app and it also boasts of 8 million mobile downloads with 4.0 user rating.